It was his fifth G1 victory in a fourth Australian state, with his others coming in Victoria (VRC Classic and Sir Rupert Clarke Stakes), Queensland (Stradbroke Handicap) and South Australia (Goodwood Handicap). 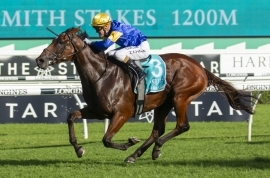 The Anthony Freedman-trained Santa Ana Lane (Lope de Vega) will now embark on an international quest with targets in Hong Kong (Chairman’s Sprint Prize) in May and Royal Ascot (Golden Jubilee Stakes) in June on his radar. Justin Bahen, who purchased Santa Ana Lane under the Flemington Bloodstock banner from Rosemont Stud for $80,000 at the 2014 Melbourne Premier Sale, struggled to hide his excitement post-race. “He’s just a champion, we love him, he’s given us so many great thrills and maybe the best is yet to come with him,’’ Bahen said. “The wet track probably cost him an Everest but that aside, he’s won so many other big ones here that it’s time to take him abroad and take on the world. Today’s victory took Santa Ana Lane’s career prizemoney to $4,955,211. Santa Ana Lane continued a magnificent record of Inglis graduates in the TJ Smith Stakes, who have now won eight of the past nine runnings of the race (Black Caviar (2011, 2013), Master Of Design (2012), Chautauqua (2015, 2016, 2017) and Trapeze Artist (2018). In today’s G1 Doncaster Handicap, second-placegetter DREAMFORCE (Fastnet Rock x Eskimo Queen) provided two significant pedigree updates. His sister is lot 444 at next week’s Inglis Australian Easter Yearling Sale, being offered by Kitchwin Hills. And his dam Eskimo Queen is lot 48 at the Chairman’s Sale - being held on the evening of Friday May 3 at Riverside Stables - also offered by Kitchwin Hills. To view the catalogue for the Easter Yearling Sale, which starts 11am this coming Tuesday and runs for two days, CLICK HERE. Meanwhile ALIFEROUS (Hinchinbrook) will back up in next week's G1 Australian Oaks following her victory in today’s G3 Adrian Knox Stakes at Randwick. The 3YO filly firmed from $51 into $21 for the Oaks with the TAB after jockey Brenton Avdulla got the best out of the Kris Lees-trained galloper. Aliferous is a $130,000 Melbourne Premier Yearling Sale buy for owners Australian Bloodstock, from the Yarraman Park Stud draft. And RINGERDINGDING (Sebring) led in a trifecta of Inglis graduates when winning the G3 Carbine Club Stakes at Randwick. It was his fifth career win and third at Stakes level. Ringerdingding beat Shuffle Up (Redoute’s Choice) and Dealmaker (Dundeel). Today’s successes come after two international Stakes victory for Inglis graduates in recent days – Bold Thruster (Turffontein) in the Listed Singapore 3YO Sprint and Fiscal Fantasy (Skilled) in the G3 Manawatu Breeders Stakes in New Zealand. Both horses are Inglis Premier Yearling Sale graduates.